Has the dollar lost it's status as the world's reserve currency? Will the US face massive inflation? James Rickards, author of currency wars discusses this on Yahoo Finance. What Will the Future of the International Monetary System Be? "Jim Rickards shares his investment tips and weighs up the risk and roles of paper, gold or chaos in the future of the international monetary system." The Fed is Racing to Create Inflation Before the US Economy Implodes! "We ask Jim Rickards of Tangent Capital Partners if this gives the FOMC more subjective leeway to ignore potential high short term price inflation. He explains that this gives the Fed the room to tell the public "inflation is what we say it is." Plus, is it better to fuel exports through dollar devaluation or innovation and investment? If you think it's the latter, unfortunately US corporations cut an estimated 175 billion dollars in investment from 2009 -- 2011. According to the Wall Street Journal, the S&P considers this cut in investment unsustainable. We talk to Jim Rickards, author of "Currency Wars," about the best way to boost exports." The new paperback edition of "Currency Wars, the making of the next global crisis" has been released and has a little surprise in it. This new edition features an all new chapter on Iran. "How the worldwide currency war, already under way, will soon affect us all. The debasement of the dollar, bailouts in Greece and Ireland, and Chinese currency manipulation are unmistakable signs that we are experiencing the start of a new currency war. Fought as a series of competitive devaluations of one country's currency against others, currency wars are one of the most destructive and feared outcomes in international economics. Left unchecked, the new currency wars could lead to a crisis worse than the panic of 2008. Drawing on a mix of economic history, network science, and sociology, Currency Wars provides a rich understanding of the increasing threats to U.S. national security, from dollar devaluation to collapse in the European periphery, failed states in Africa, Chinese neomercantilism, Russian adventurism, and the current scramble for gold. James Rickards, an expert who has worked at the highest levels of both finance and national security, explains everything we need to know about this growing global standoff. He takes readers around the world and behind closed doors to explain complex financial and political currents with absorbing firsthand anecdotes." If you havn't already got your copy of this best selling book, make sure you get one today! 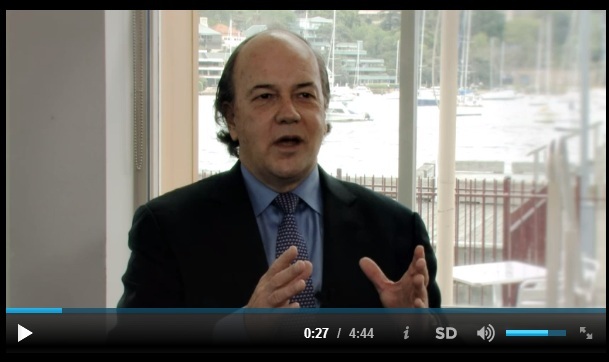 "Tangent Capital Partners Senior Managing Director James Rickards talks about the global currency war. He speaks on Bloomberg Television's Lunch Money." - Presentation of the book Currency Wars. - Total inflation to come, and risks financial destruction of the people. - Exercises of financial war by the Pentagon. - Financial war against Iran, and results. - Gold stocks of the United States (they do exist? ).